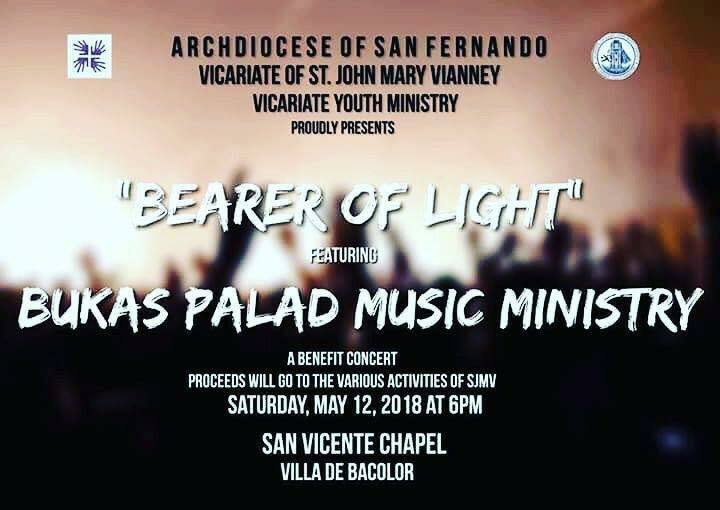 Bukas Palad Music Ministry in Concert” Bearer of Light….LIVE in PAMPANGA…. The Mater Dei Chorale group of San Nicolas De Tolentino Parish, Macabebe, Pampanga and Himig San Nicolas of the Shrine of Our Lady of Lourdes, Cabetican, Bacolor, Pampanga will join us.They will render songs as guest performers. Let us allow ourselves to be evangelize through their songs such as Humayo’t Ihayag, I will sing forever, Panalangin sa pagiging Bukas Palad and many more. Please help us and support the young people of St. John Marie Vianney Vicariate. Tickets are available at the San Guillermo Parish, Villa de Bacolor Pampanga on sunday April 22, 2018, we will sell tickets every after the celebration of the Holy Eucharist.